PEORIA, IL - The Peoria Chiefs have announced that 22 games in the 2019 season will feature the popular post-game fireworks shows from Central State Fireworks. Starting Saturday, May 4, every Saturday home game and nearly every Friday home game will feature fireworks, plus a few additional dates as well. The 22 fireworks show for 2019 are all following 6:35 p.m. games with four in May, eight in June, five in July and five in August. Of those shows, 10 will be on Saturday (May 4, May 18, June 8, June 15, June 22, June 29, July 13, July 27, August 10 and August 17), seven will be on Friday (May 17, June 7, June 14, July 12, August 2, August 23, August 30), two on Wednesday (July 3 and July 31), two on Thursday (May 30 and June 20) and one show on Sunday, June 30. 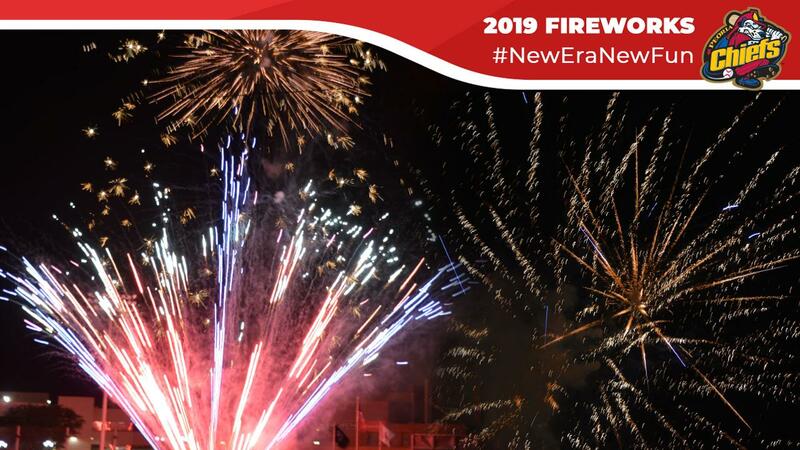 "We are very excited to once again bring the best fireworks shows in central Illinois to our fans throughout the 2019 season," said Chiefs General Manager Jason Mott. "We have put together a very aggressive and unique promo schedule for the upcoming season and this fireworks package is a big part of it that our fans enjoy." As announced last week, four of these dates also include bobblehead giveaways. Saturday, May 17 will feature the Nolan Gorman bobblehead giveaway (first 1000 fans 13 and over) and then post-game fireworks. The Saturday June 8 bobblehead giveaway is Jordan Hicks with post-game fireworks Saturday June 29 the Chiefs will have an Albert Pujols 3000 hits bobblehead giveaway and post-game fireworks. The final bobblehead and fireworks combo comes on Saturday, July 27 with a Javier Baez bobblehead. The giveaways, promotions and theme nights that go with the remaining 18 fireworks shows will be announced later in the off-season. Season ticket packages and group tickets for the 2019 season are currently on sale by calling 309-680-4000. The 2019 season kicks off April 4 in Cedar Rapids, Iowa with the home opener against the Beloit Snappers set for Saturday, April 6 at 6:35 p.m.